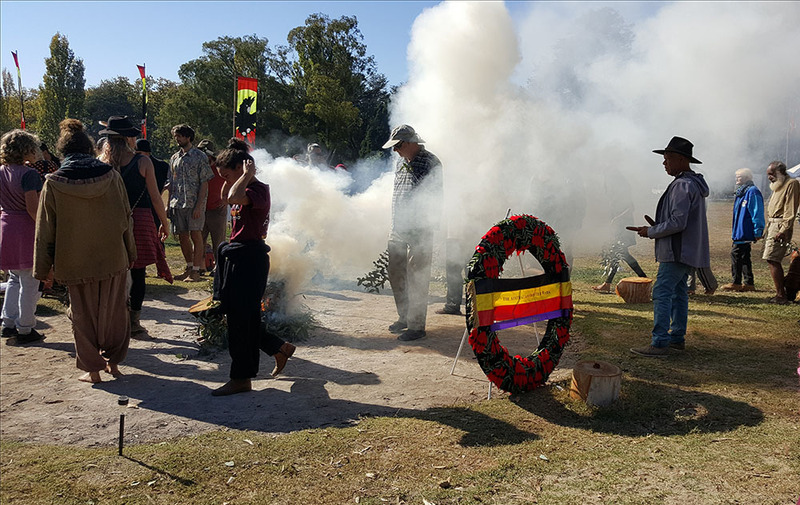 Early last December, there was Sorry Business at the Tent Embassy in Canberra. A Nunukul Elder from Minjerribah (Stradbroke Island), one of four Embassy founders, died here. Talking, singing in language, stamping feet and clapsticks and didgeridoo remembered him and bid farewell amid huge plumes of smoke. Now elders continue to carefully encourage young people to step up. This was clear during the Frontier Wars Camp in the lead up to Anzac Day. Children on school holidays at the Embassy during learned without lecturing, painted up along with the adults on Anzac morning. Barkandji elder Uncle Marbk Wilson spoke each morning for unity and reconciliation, which can only come from justice, with invasion finally defeated. those tell tale signs of the days to come. ‘I see the big spirit in him. I want to encourage him to be a future leader,’ said Uncle Marbk. Walmajarri woman Gabby Baxter’s grandmother, a renowned artist, was one of the group who walked from the desert in the1960s, never before having seen whitefellas. Gabby’s father told Gabby it was important that she speak and helped her come forward. “I was proud to represent the Walmajarri nation at the Tent Embassy remembering that Walmajarri people have also been impacted by the frontier wars,” she said. Uncle Marbk’s son, Dean Peachey, danced his father’s wedgetail eagle story in the War Memorial forecourt on Anzac Eve. Elders welcomed anyone who listened and was prepared to stand with them. Hazel Davies is one who has listened, learned and dreamed. A commemorative florist and TAFE teacher, five years ago she saw the same brilliant colours of the Flanders Poppy in the Desert Pea. Hundreds of Desert Peas were made during the week-long workshops where Hazel Davies created the wreath carried into the War Memorial, after the Anzac Ceremony. Desert Peas grow, she was told by Uncle Marbk, where blood has been spilled.